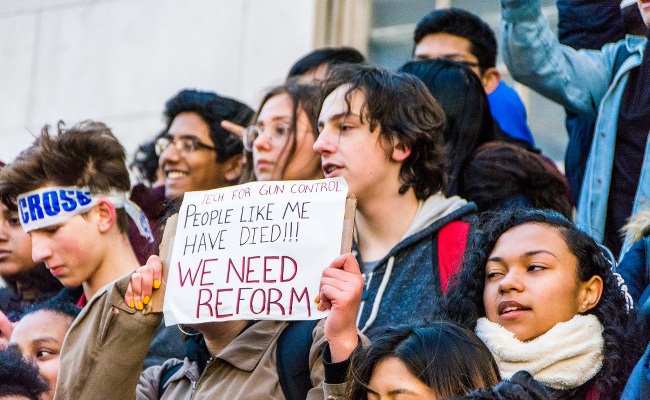 For the second time this year, student activists are leaving the classroom and taking to the streets in protest of the U.S. gun violence epidemic. Organizers say there are 2,100 individual walkouts scheduled across the nation today — and the date of April 20 was carefully chosen: It’s the 19th anniversary of the Columbine school shooting, which shocked the United States in 1999. The idea for the walkout comes from a Connecticut student, Lane Murdock. Youth organizers are feeling frustrated with inaction in Congress, which they say endangers students by failing to put checks on the proliferation of assault-style firearms. One way to get attention is to strike, and that’s precisely what students plan to do as they leave classrooms at 10 a.m. local time and make their voices heard in a coordinated way. Holding elected officials accountable by publicizing inaction. Suggesting concrete solutions to gun violence. Getting youth engaged in the political system; for some organizers, this includes registering students to vote. Each school is organizing its walkout differently; the organizers are generally asking students to leave their classrooms and congregate at a common area, possibly outside or in a location like the gym. Once students have assembled, they’ll be taking 13 seconds of silence to honor the dead at Columbine before opening up for speeches and commentary. The walkout will continue until the school day comes to a close. Some students are taking the march to local offices of lawmakers, or uniting on calls to flood legislators’ offices with comments. At Columbine High itself, school will be closed for the day, and students will participate in a day of service. This has been the school’s approach to the grim anniversary for many years. School administrators suggested that other Denver-area schools do the same. If you’re an adult, you may be wondering how to support students and organizers involved in this event. One of the best strategies is to simply get out of the way and make sure student voices are heard. However, you can also ask local organizers if they need assistance with anything, whether it’s picking up more voter registration forms, helping to direct traffic, providing financial assistance or backing up students in confrontations with unsupportive adults. This may be especially important in schools where officials try to prevent walkouts or threaten punishment. During the last national school walkout, the ACLU warned that protest is a right for students just like everyone else. That means students can’t be punished for expressing their political views — although they can be penalized for missing class. If your district has threatened to sanction students, call to offer your opinion on this issue, whether or not you have children in the school system. There’s another way you can support the young people in your life: Encourage their interest in politics, and connect them with resources they need. Maybe that’s proving contact phone numbers for elected officials, information about voter ID laws or something else that will help them engage politically. This walkout can also be a prompt to you and your friends to be more politically engaged: Double check that your voter registration is current, consider donating to and/or volunteering on a fall 2018 campaign, and take a few minutes at least once a week to call your legislators about issues that matter to you — like gun control, education funding and campus free speech. Demand that the U.S. Congress pass legislation to ban assault rifles by signing this Care2 petition. You do know that assault rifles were not used at Columbine right? They used shotguns and handguns and bombs that did not go off.